I wouldn't have otherwise seen. And last night, a Serbian mail-artist posted a beautiful picture of an underwater installation that led me to the website of artist Jason deCaires Taylor. How could I never have heard of this guy? I spent a very long time looking at his amazing works. I am so moved by them. 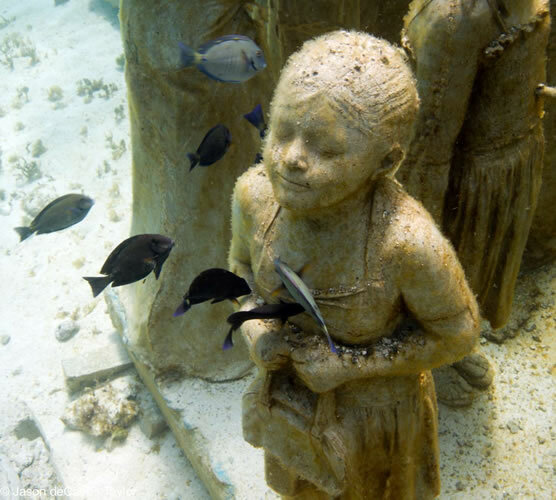 There is much going on here-- the beauty and poignancy of the models, the interactions of the living environment in the moment, and the inevitable deconstruction/remaking of the statues as nature moves in. Take a few minutes to visit his website, or view the film below. We are lucky to have artists who can articulate what we feel but can't explain. Thank them by visiting galleries, museums and especially by investing in their work. If you're from the valley, this weekend's a good time to start. Come to Corvallis's Fall Festival, where over 160 artists will be displaying their efforts. Stay for the Saturday night dance!